Select and convert data from one data format into another ( ie PDF to Excel ) ! Able2Extract is the Ultimate data conversion utility! It's the only solution on the market that allows you to convert data from PDF, HTML and Text source formats into formatted excel spreadsheets, word and text programs. Convert PDF into formatted Excel spreadsheets, Word and Text formats. Convert Html into formatted Excel spreadsheets, Word and Text formats. 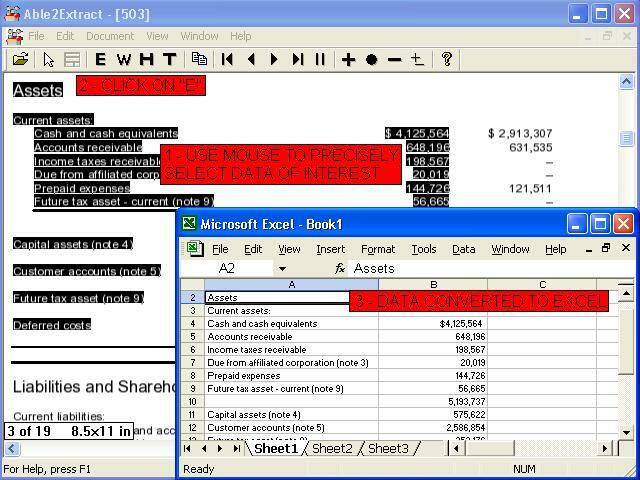 Convert Text and documents into Excel and Word.